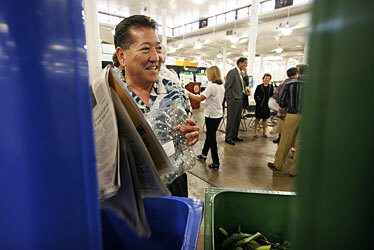 City Environmental Services Director Eric Takamura holds some examples of trash that can be recycled during a presentation on the city's recycling program. The City Council is expected to approve the recycling program islandwide. The City Council today will likely approve a bill authorizing islandwide curbside recycling, an issue that seems to have this typically divided body in agreement. The proposal requires the city to implement a long-awaited islandwide curbside recycling program, estimated to cost about $9 million, by February 2009, unless there's a lack of funds. The vote comes in time to allow the city to charge Mililani residents an optional $10 a month fee in a yearlong pilot project that began last week. Beginning on Jan. 7, the city will eliminate the free second weekly trash pickup in Mililani and Hawaii Kai, giving Mililani residents the option to pay for it. But some councilmembers had to compromise to ensure the bill would pass today. Councilmembers Donovan Dela Cruz and Ann Kobayashi wanted to exempt low-income families from paying the charge for the second-pickup option. They dropped the fee waiver after opposing testimony from Eric Takamura, director of the city Department of Environmental Services, saying the department doesn't have the staffing required to sift through the paperwork in time, which would delay the pilot project. "It seems like a small amount of money, but for some people who are having a hard time, that is a lot of money," Kobayashi said. "The main thing is to keep the program moving forward rather than this being an obstacle." Some councilmembers also pushed for stronger language to ensure islandwide curbside recycling would start by Feb. 1, 2009, after Takamura said it would be difficult to have a complete program by then. "You can see how quick a timetable it is," said Suzanne Jones, the city's recycling coordinator. "Because everyone is so interested in recycling, they're asking us to be aggressive." Jones said city employees would have to process information from the pilot project while simultaneously expanding the program. Under the proposal, the city would be allowed to phase in the program, meaning it can start curbside recycling for some parts of the island while officials figure out the logistics for more difficult areas, such as narrow streets that large automated trucks can't navigate. During community meetings in Mililani and Hawaii Kai earlier this year, Mayor Mufi Hannemann said he's serious about an islandwide curbside recycling, which would be based upon results of the pilot project. Councilman Gary Okino, chairman of the committee that oversees solid waste issues, said he opposes a second weekly trash pickup in an islandwide curbside recycling program because it would require more collection routes, which would increase costs.